High-Tech Auxiliary Flooding Nozzles/Purging Cups for Hand-Held & Machine TIG Torches. Precision designed auxiliary flooding nozzles / purge cups are engineered to deliver a coherent umbrella of shielding gas for the most demanding TIG/GTAW welding of reactive metals such as titanium, molybdenum, nickel-based and aluminum based alloys as well as non-reactive metals like stainless steel. These shields provide an inert atmosphere for increased weld-quality, consistency and reduced gas consumption, while minimizing post-weld cleanup. Designed to work with the industry's most common machine or manual (hand-held) gas tungsten arc welding torches, these precision devices optimize distribution of the shielding gas, and maintain correct gas velocity ratios between the multiple gas paths. Developed for high-tech TIG/GTAW welding, these nozzles are engineered to flow shield gases over a targeted area to promote sufficient cooling, prohibit exposure to oxygen, and prevent weld contamination. 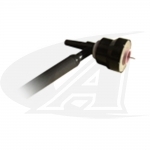 Auxiliary Shields are available for both Hand-Held and Machine TIG torches and in sizes 1.5" (38.1mm) and 2" (50.8mm).